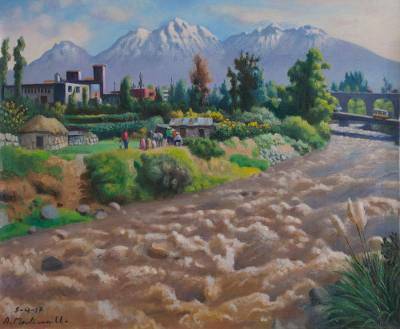 Signed Original Oil Painting of a Peruvian Landscape, "Chili River"
By Alcides Medina Umeres, all is color in the Arequipa countryside in the Peruvian Andes. Farmers work on the shore of a rushing river that tumbles over stones in this nostalgic painting. Guarded by towering mountains, this peaceful hamlet looks onto to an aqueduct and a narrow bridge that cross the Rio Quilca, also known as the Chili River. Pre-Hispanic residents practiced rituals along the shore, in gratitude for its waters that permitted them to irrigate their crops.